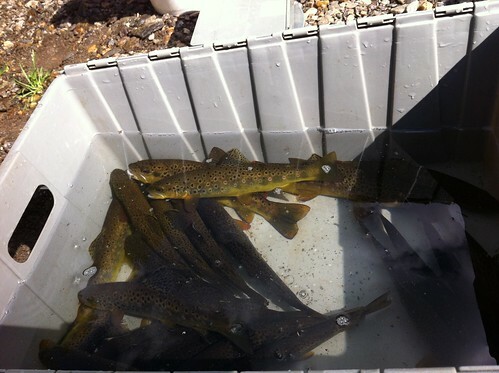 The Gunpowder is flowing at 31 CFs, is 54F to 56F in the catch and release section and is clear. The MD DNR Fisheries shocking survey is over. Thanks to all who participated! We’ve heard good initial reports of young of the year and a lone American eel at the Falls Rd station. The Bluemount station continues to produce chunky wild trout and seemingly limitless suckers and sculpins-their is a connection here. As soon as the official #’s are out we’ll post them on the site. Until then get out and find some wild browns on the end of your line. Until the first hard frost, hoppers and crickets are still in the mix-especially through the Bunkerhill section. Rainy afternoons and accompanying clouds have prompted a few Olives. We just received some beautiful parachutes down to a #22 from Mike Bachkosky-they have bright green posts for a reason! Staying on the small side, Tricos are still present most mornings but most anglers have reported sporadic rises. Stay witha 12ft 7x leader and think: short cast…long drift. A few Slate Drakes have been reported downstream of the catch and release area, so fish an Adams in the flats. Light tan and olive Elk Hair Caddis in the #16 to 18 range have accounted for a number of fish this week. These patterns are easy to fish, and skate like mad as long as they’re dressed with some powder and fished through the riffles. This entry was posted in fishing report on September 27, 2012 by Theaux Le Gardeur. This just in from Fisheries…Thanks to Mark Staley for the invite! Meet at 9:30 am at the upper lot on Falls Rd. Meet at 9:30 am at the Bluemount Rd. lots and carpool down the NCR trail to the station. 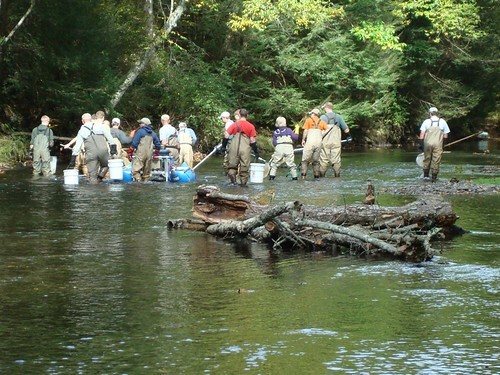 Chest waders will be necessary for those who want to participate in the electrofishing. Anyone is welcome to attend and observe, however not everyone will be able to participate in the actual electrofishing. Bring your favorite net and electrofishing gloves if you have them. Please disinfect your waders before attending if you have been in other waters recently. We will provide disinfectant for those who need it at the beginning and end of each day to help prevent the spread of didymo, etc. Contact us at the office: 410-442-2080 or 301-854-6060, cell ph. 240-344-7352 if you have questions about the survey or the schedule. We will try to keep the schedule as posted. High flows and heavy rains will require us to reschedule. Please respond if you plan on attending so we can plan accordingly. This entry was posted in news on September 18, 2012 by Theaux Le Gardeur. Please join us for a fly fishing school. On Sunday, September 30, a Backwater Angler Guide will be teaching a fly fishing school that is ideal for beginners. If you’re planning on flyfishing Maryland, or anywhere else for that matter, this course is a great introduction to the sport. The school covers knots, casting, gear and fly selection. Class is held from 11:00 AM till 2:00 PM. Cost is $100 per person and includes the use of gear. 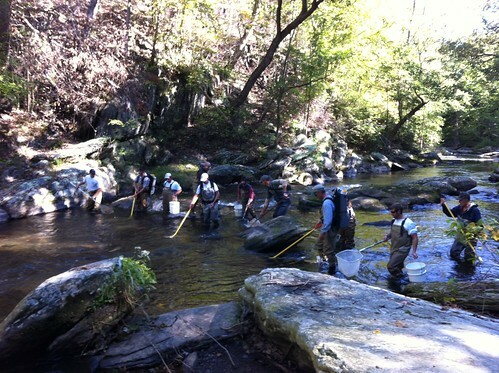 A Maryland non-tidal fishing license and trout stamp is required and may be purchased at the shop with check or cash the day of the school. Class size is limited to 4 and pre-registration is required. Please give us a call at 410-357-9557 to pre-register. This entry was posted in events, news on September 17, 2012 by Theaux Le Gardeur. This entry was posted in fishing report on September 9, 2012 by Theaux Le Gardeur. The Gunpowder is flowing at 121 CFs and is 55 F and clear. 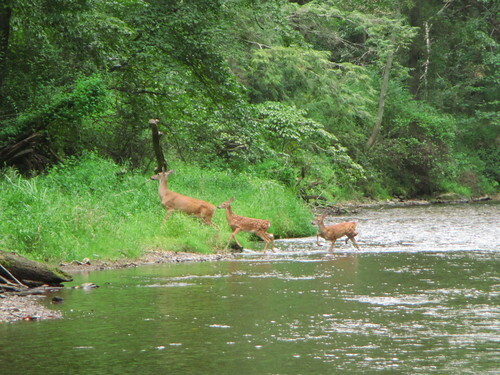 The river is at a great level for wading. 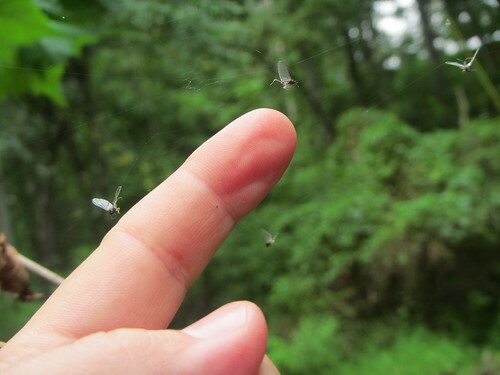 Tricos are in the spider webs and the flying ants are around mid-day. Beetles and hoppers are still working in the backeddies. With slightly higher flows over the weekend, streamers are also a good bet. Longer leaders in the 12ft 6x and 7x range will help keep the Tricos drifting at the right speed among the leaves. Use plenty of shot or Loon deep soft weight well ahead of streamers so they track down on the strip. Larger hoppers will trick fish but don’t show them to a fish more than twice. Summer is fading along the Gunpowder, with consistent flows the fly fishing is improving. This entry was posted in fishing report on September 1, 2012 by Theaux Le Gardeur.